Awesome High Elves Dragon Painting Guide! The High Elf Dragon is one of our largest and most impressive Warhammer models. In this article Martin Footit talks about how he designed this Citadel Miniature and Neil Green provides a detailed painting guide. The article was first shown in the December 2007 issue of White Dwarf. 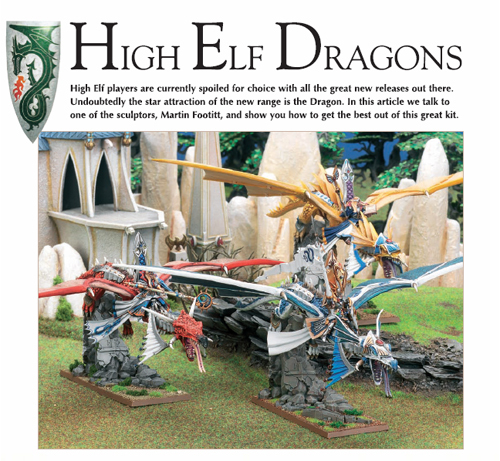 This awesome High Elves dragon painting guide was just released into the White Dwarf online archives. Lots of product creation goodies and painting tips, get it directly from this link here. Loved it!